1) has been visibly shifted by ice. 2) has remained rooted at its initial location in host bedrock. Monoliths are important in sequencing paleoclimate events because, more than any other type of bedrock disruption, they are separable from the explicit consequences of glacial ice flow. In particular, moving glacial ice cannot directly cause the formation of frost-heaved monoliths. Furthermore, in many instances glacial ice movement would be expected to erode, disrupt or obliterate frost-heaved monoliths protruding into an ice stream. The number of individual occurrences of frost-heaved bedrock monoliths in the Heart of Avalonia region is uncountably large, and they are found over a wide geographic area. Nevertheless, monoliths occur only in specific zones and the density of their occurrence is highly variable, ranging from non-existent or sporadic to densely clustered. Other frost-related bedrock disruption features such as fissures and frost-wedged hillsides frequently accompany dense occurrences of frost-heaved monoliths. Frost-heaved monoliths form a diverse group of geomorphic features, varying greatly in size, shape, inclination and general appearance. The above diagram shows many of the basic elements involved in forming a frost-heaved monolith. Usually, a system of joints in the host bedrock defines at least one pair of opposing surfaces of the frost-heaved block. Frequently, two pairs of surfaces, front/back and sides, are defined by pre-existing joints. The bottoms of frost-heaved blocks are sometimes irregular, but commonly, the ice accumulating underneath the block starts out in a joint roughly orthogonal to the front and sides, this joint then defining the bottom. 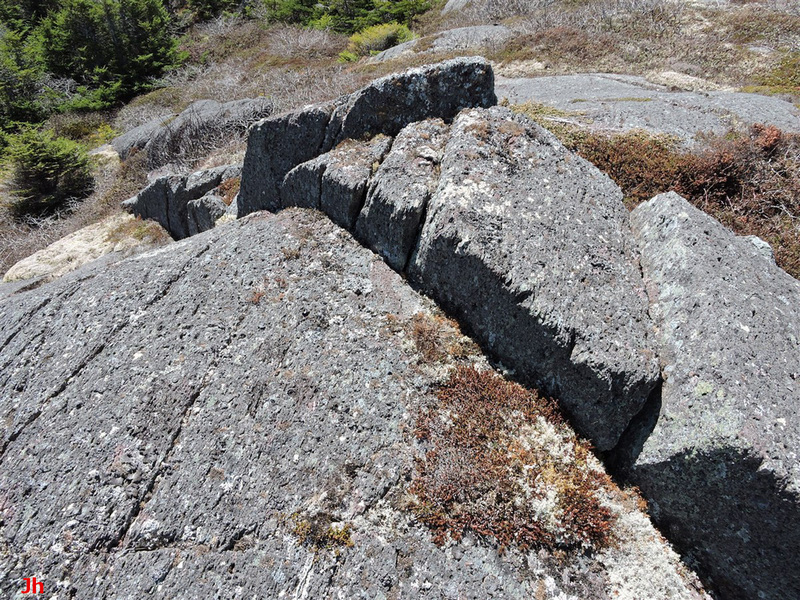 Frost-heaved monoliths are often roughly rectangular as viewed from above, but can be triangular, polygonal, or irregular. The sides of the blocks need not be perpendicular to each other or to the bottom, and shapes such as inverted pyramids have been observed. 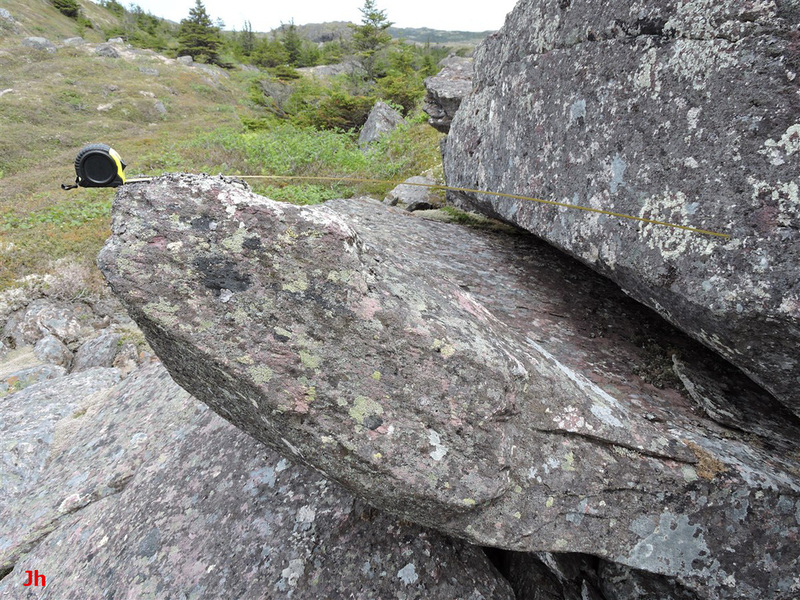 Generally, the more strongly foliated the host bedrock, the more regular are the shapes of frost-heaved joint blocks. 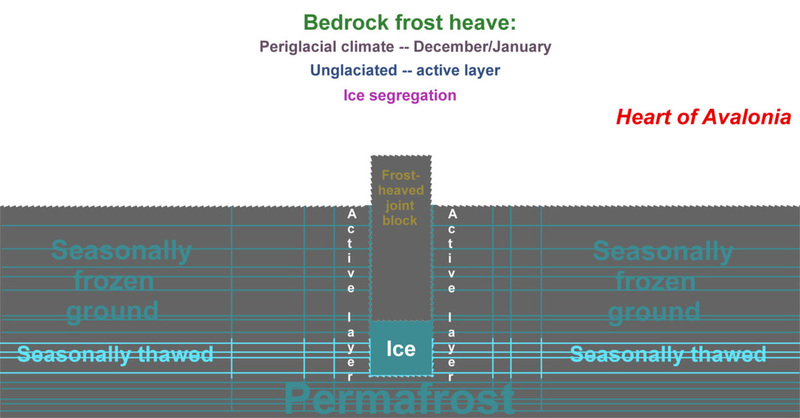 The illustration above shows permafrost underlying the frost-heaved block. The key role of permafrost is in water retention. Regardless of the mechanism causing frost heave, the frost-heave process cannot function if there is an air-gap underneath the block. Present-day observations of frost-heaved joint blocks in Heart of Avalonia usually show air-gaps underneath the blocks in the summer (in those cases where the underneath space is accessible). Unless these often-substantial gaps were to fill entirely with ice in the winter (not ever observed, but snow hinders winter observations), there is no possibility of present-day ongoing uplift. A frost-heaved joint block surrounded by ice is "frozen-in" and cannot move without the ice surrounding the block yielding in creep. Thus, the rate of uplift of the block is potentially governed by ice creep rates, as well as by rates of ice accumulation beneath the block. 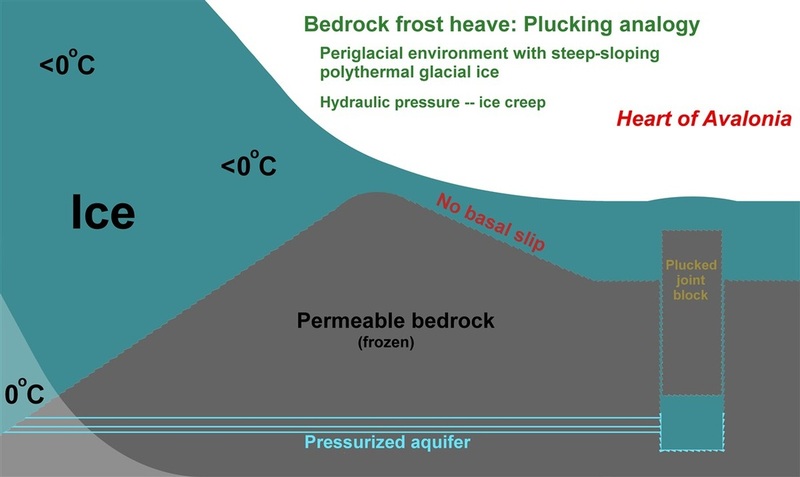 The above diagram shows an active layer in the bedrock permafrost surrounding the frost-heaved monolith. The key role of the active layer is to provide liquid (hence mobile) water to the space underlying the upward-moving block. 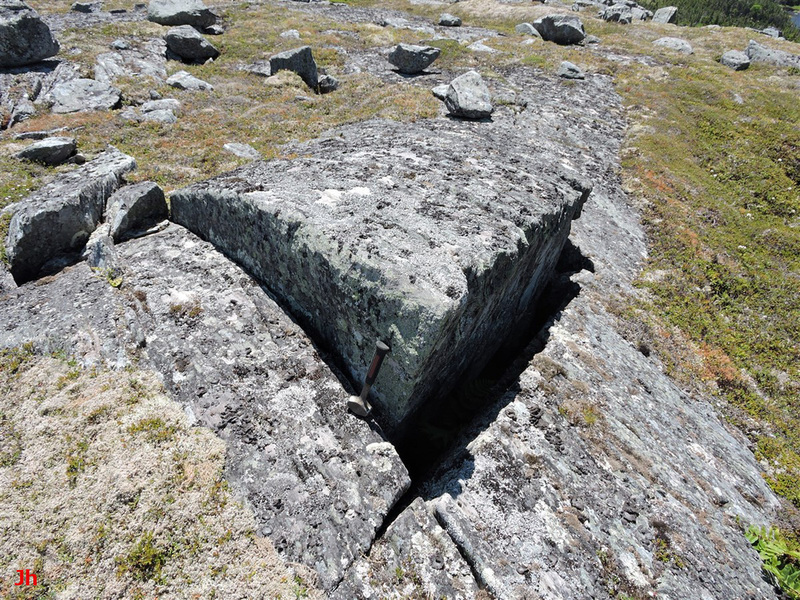 In a periglacial climate, summer warmth can push thawing conditions several metres down into frozen bedrock. There is a then a multi-month time delay between the winter cooling of upper bedrock layers and the refreezing of the bottom of the active layer. It is during this period when cold, frozen surface rock overlies warm, thawed bottom rock, that water will migrate down the thermal gradient (gravitationally upward) and potentially segregate in an accumulating body of ice beneath a joint block. Other processes, involving additional conditions beyond the presence of an active layer, may account for frost-heaved monoliths in special cases. Such special processes show indications of involving pressurized groundwater from nearby steeply-sloping glaciers and would therefore more closely resemble glacial plucking than the ice-segregation-driven frost-heave process presently under discussion. These possible mechanisms for "horizontal plucking" will be described later in this section. The following diagram illustrates the ice-segregation mechanism for generating frost-heaved bedrock monoliths in a periglacial climate. 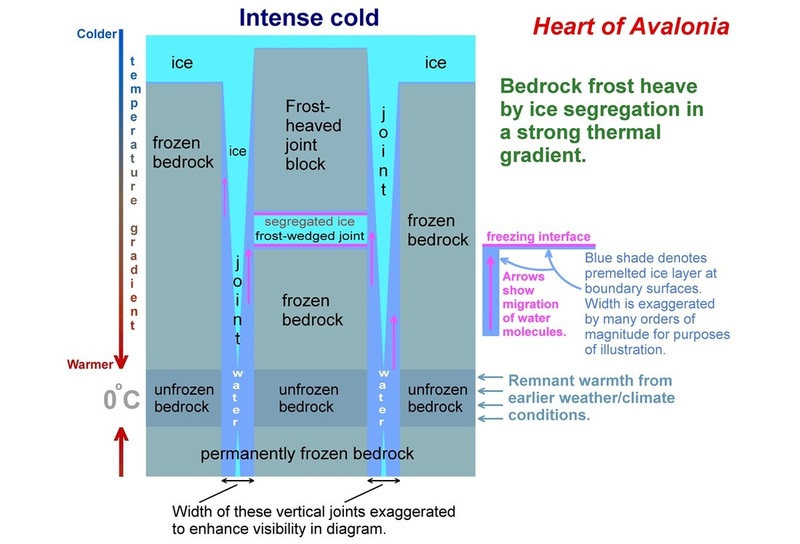 This segregation mechanism (no longer operating in the present climate) likely accounts for most frost-heave monolith occurrences observed in Heart of Avalonia. 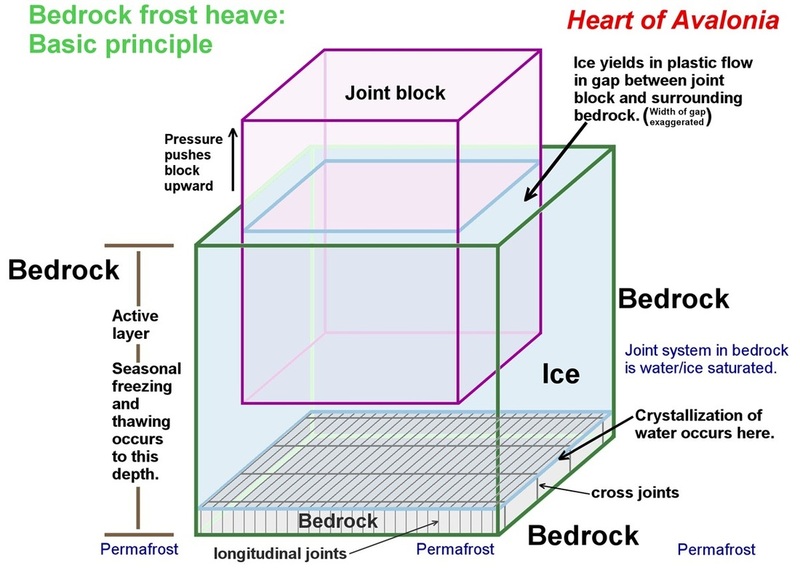 The above diagram shows a layer of glacial ice overlying the frost-heaved joint block. This surface ice has been included only for generality. In most cases glacial ice would not exist at an active frost-heave site. The development of a deep active layer (such as that illustrated) is strongly impeded by the presence of any overlying glacial ice which would limit the surface temperature to a maximum of 0 deg. C at midsummer. Only shallow frost-heave would be expected under such conditions. Nevertheless, some instances of frost-heaved monoliths, apparently having developed under glacial ice, have been observed. These observations will be mentioned below and then described in more detail in subsequent sections. The above diagram does not specifically indicate the reservoir of mobile groundwater needed to fill the expanding space as the frost-heaved monolith rises. This water could drain down locally from the surface in the summer or it could be present in an extended aquifer lying above permafrost. 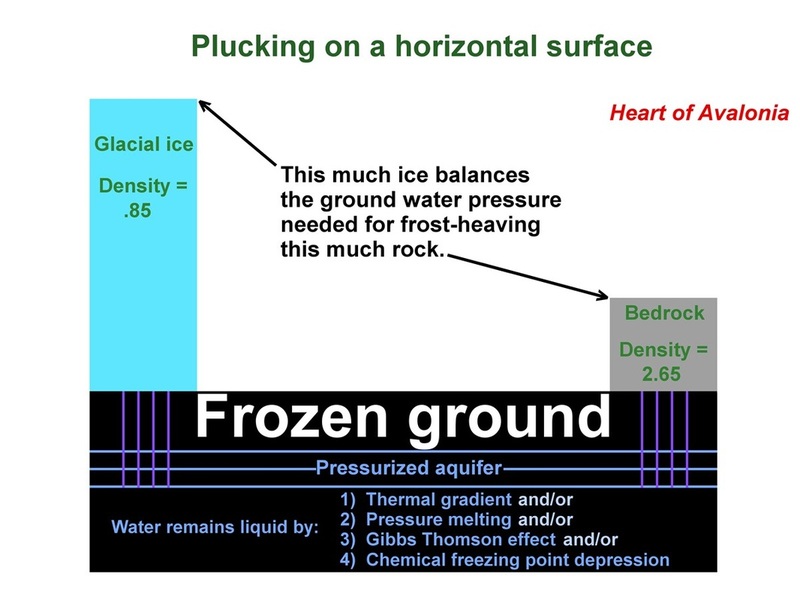 Abundant joints in the bedrock provide room for groundwater to reside and for water to move toward the area of ice accumulation (see second diagram below). The following diagrams present two contrasting models for the formation and uplift of a frost-heaved bedrock monolith. 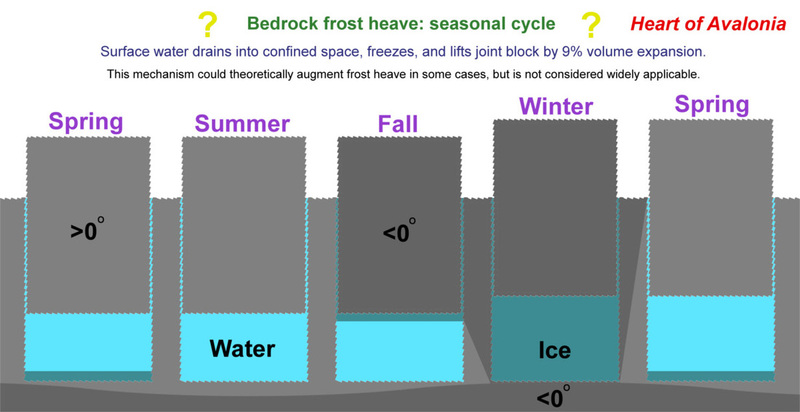 The first diagram above shows what seems to be an intuitive explanation for the occurrence of frost-heaved bedrock monoliths, driven upward by the same forces that would burst a frozen water pipe. While this ice-expansion model cannot be discounted in all cases, it lacks a mechanism for starting the frost-heave process (a narrow joint would require very many cycles to widen out significantly) and the model depends on the confinement and repeated melting and refreezing of a significant volume of water. The ice-expansion model is considered improbable and the ice-segregation model shown in the second diagram above (see also previous ice-segregation diagram in this section and description in Periglacial Processes) is a more widely applicable alternative. As discussed previously, bedrock frost heave by ice segregation (second diagram) requires both a thermal gradient and an available groundwater supply. The process would operate efficiently in midwinter, with residual summer meltwater (zone marked "seasonally thawed' in diagram) lingering at depth in abundant joints. Within this model, the presence of relict frost-heaved monoliths formed by deeply-rooted ice segregation becomes a potential indicator of a polar paleoclimate existing in an area with thin or absent ice cover. 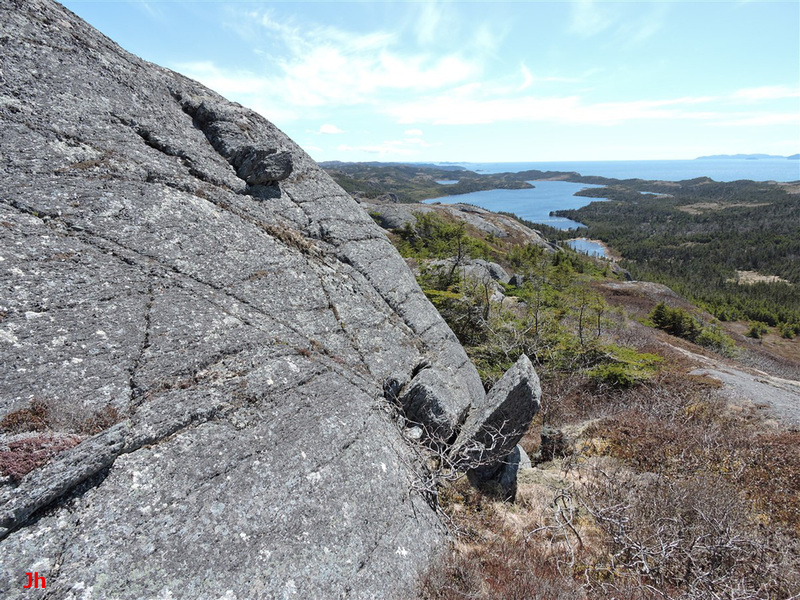 Polythermal glaciation and "horizontal plucking"
Some field observations of frost-heaved monoliths suggest that supplementary frost-heave processes may sometimes enhance, or in certain cases replace, the more basic action of ice-segregation. These supplementary processes are linked closely to the presence of nearby glacial ice. 1) Evidence of single joints providing water to multiple frost-heave occurrences. 2) Evidence of frost-heaved monoliths occurring in close association with features resembling glacial plucking. 3) Evidence of frost-heaved monoliths having formed adjacent to moving glacial ice or underneath moving glacial ice. Each of these types of observations are discussed in more detail in other sections (pending), particularly in the sections Illustrative Features. Following are photos exemplifying the three cases, along with brief explanations. The above photo shows a chain of frost-heaved monoliths that developed along a single cross joint (or group of closely spaced parallel cross joints) in foliated bedrock. The monoliths average about 30 cm high. This occurrence suggests that water feeding upward from the cross joint(s) probably played a role in promoting the frost heave. Nearby glacial ice could account for pressurized water existing in bedrock joint systems. The elongated block lying just right of the measuring tape in the above photo appears to have been lifted up and then displaced from the hole (hole partially obscured by vegetation) centered under the opposite end of the tape. The distance indicated on the tape is 160 cm. This block occurs within a dense cluster of frost-heaved bedrock monoliths that extends over a substantial area. 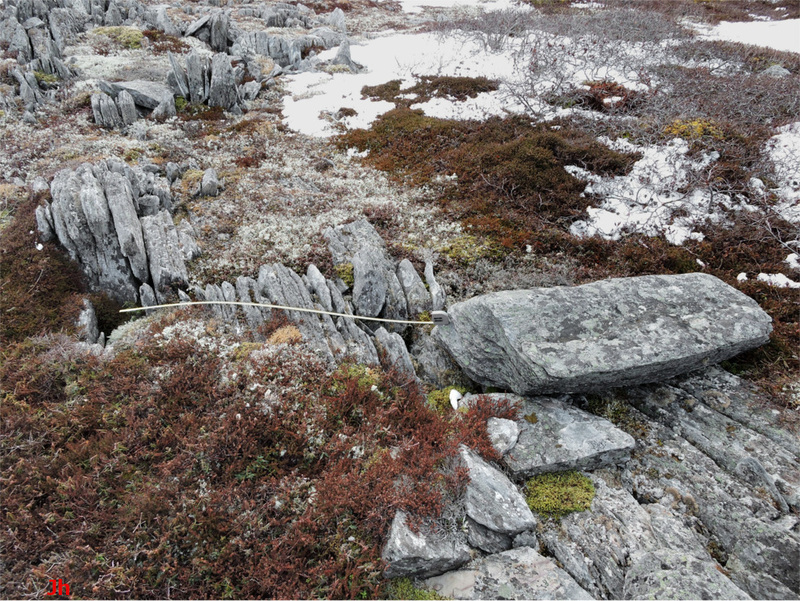 Glacial ice has apparently transported the uprooted block by the indicated 160 cm. Either the block was frost-heaved upward through a layer of glacial ice or else glacial ice encroached on the area after the frost-heave event. This occurrence could represent an example of hydraulic bedrock frost heave (see below and Technical Note 5). ​Each of the examples provided above suggests a relationship between the development of frost-heaved monoliths and processes related to nearby glaciation. The following diagrams illustrate potential links between glacial ice and bedrock frost heave. The above diagram shows a simplified example of "horizontal plucking", leading to the development of a frost-heaved bedrock monolith. This diagram closely follows another diagram (see Glacial Processes) showing plucking by a warm-based glacier encountering an obstructing hill. Without the continuous presence of glacial ice overlying the displaced monolith, the above-illustrated plucking analogy breaks down because the temperature regime at the monolith would be highly variable, both day/night and seasonally. Variable temperature implies inconsistent confinement of water/ice around the block. The diagram is probably an over-simplification. The illustration above shows bedrock frost heave occurring in a polythermal glacial environment. A polythermal glacier, incorporating both warm-based and cold-based glacial zones, could develop when a warm-based glacier was exposed to rapidly cooling climatic conditions. 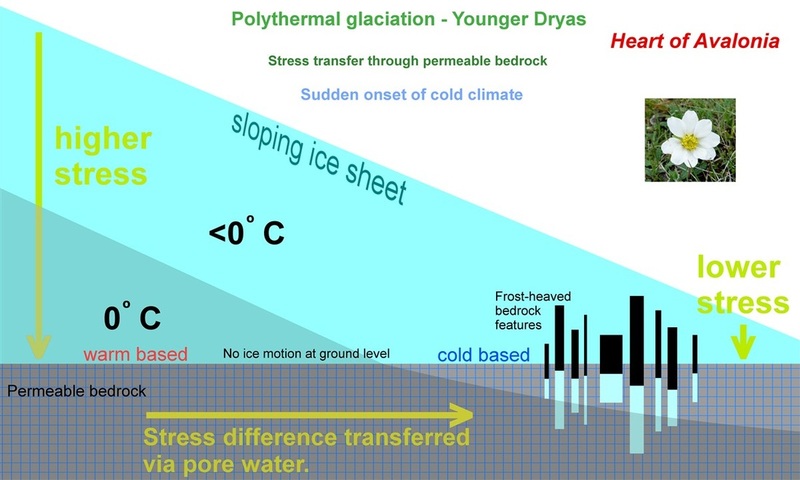 Rapid cooling at the onset of the Younger Dryas stadial (see also Regional Paleoclimate) might have promoted development of polythermal glaciers. Temperate ice existing beneath cold ice can develop during the large time interval (years or decades) needed to transfer heat through substantial ice thicknesses (discussion and charts provided in Technical Notes). The force needed to cause bedrock disruption in the situation illustrated above could stem entirely from hydraulic pressure (see Technical Note 5), transferred via groundwater from a remote mass of elevated glacial ice. In theory, no assistance from a heat-driven mechanical process (ice segregation, ice expansion) is needed. However, it is likely that in cases where hydraulic pressure helps drive frost heave, the frost-heave process is aided by heat-driven processes and that bedrock frost heave remains primarily a periglacial active-layer occurrence. The diagram below shows how much height of glacial ice is required to counterbalance the weight of a frost-heaved bedrock monolith. Transfer of stress from a glacier to a remote section of bedrock requires the presence of an artesian aquifer that does not freeze. Four possible causes for groundwater to remain liquid below frozen ground are indicated in the diagram. The most probable cause is that deeper rock is warmer than surface rock. The geothermal gradient eventually guarantees warmer temperatures at depth, but the magnitude of the gradient (typically ~0.025 deg. C / m) is small enough that changes in weather and climate would dominate the geothermal gradient in the last few metres of rock adjacent to the surface. Hydrostatic pressure causes freezing point depression (0.0007 deg. C / metre of ice, .002 deg. C / metre of rock). The pressure-melting effect is very small but is reversible when pressure declines, theoretically promoting near-surface refreezing. The Gibbs Thomson effect can produce arbitrarily large amounts of freezing point depression in arbitrarily narrow channels of confinement. This effect underlies the ice segregation mechanism and can be very significant in narrow, partially-frozen joints. However, in millimetre-scale flow channels (or larger-width channels), the Gibbs Thomson effect does not cause significant freezing point depression. The presence of dissolved anions or cations derived from rock can theoretically depress freezing point. Soluble cations such as Na+, K+ or Ca++ are abundant in rocks, but soluble anions such as Cl-, CO3-- and SO4-- are considerably less common. The likelihood of significant leaching of soluble compounds from rock would increase when groundwater remained in the rock for a long time. Any freezing point depression caused by dissolved impurities in groundwater would not generally be reversible. 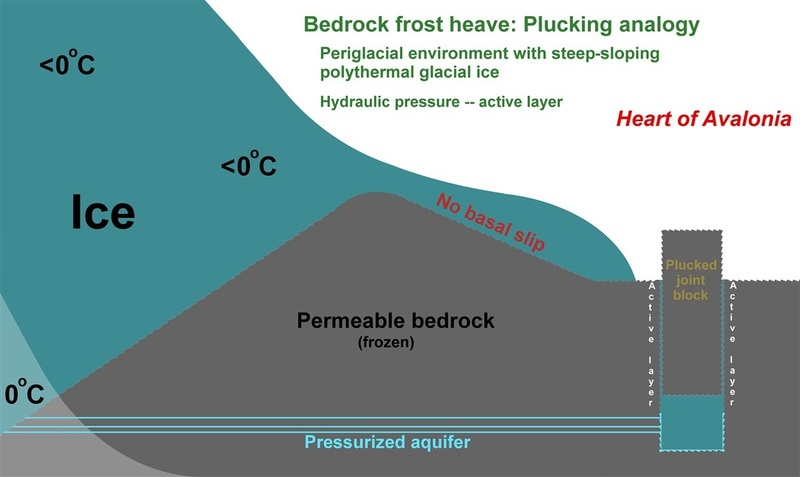 The above diagram depicts a hybrid frost-heave process where ice segregation under periglacial climate conditions is assisted by artesian groundwater originating from a nearby polythermal glacier. An environment like this could account for dense clusters of abundant and large bedrock-frost-heave monoliths such as are observed in some cases (see Illustrative Features). If, during the Younger Dryas cold period, depleting warm-based glaciers were converted to polythermal glaciers, then nearby thinly glaciated or unglaciated bedrock areas could experience "horizontal plucking" as illustrated above. As in the more conventional definition of plucking, stress is transferred downstream from higher-elevation glacial ice by meltwater moving through porosity (joints) in the bedrock. As long as ice cover over the frost-heave zone was thin or not present, then a temperature gradient in the bedrock could enhance frost-heave through ice segregation. Field observations showing vigorous frost-heave monolith development blending smoothly over into a plucked hillside support the "horizontal plucking" scenario in some cases (see Illustrative Features, pending).